The European Handball Federation has entered new territory in its coverage of Europe’s premier club handball competition, the VELUX EHF Champions League. Airing for the first time on the EHF’s Snapchat channel, ehf_live, on Friday 10 February, “The Handball Zap” is a magazine show that has been specifically produced for the fast-growing social media channel with the intention to attract younger audiences to the sport. “The Handball Zap” can be seen twice a week, every Friday and Monday around 12:00 hrs CET, first giving followers a glimpse of what to expect from the weekend’s matches, including the highlight “Match of the Week”, then at the start of each week recapping the highlights. 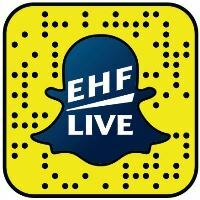 To watch the first episode, add ehf_live to your Snapchat contacts. Host of the “The Handball Zap” is Irish handball international Brian Campion who was already the face of the EHF’s Snapchat coverage at the Women’s EHF EURO 2016. “Ever since we launched our Snapchat channel in autumn 2015, it has become a great tool for us to tell the stories of handball in a different and exciting fashion, appealing to younger audiences, the handball fans of the future,” says JJ Rowland, EHF Head of Media and Communications. "The coverage at the Women's EHF EURO 2016 was so widely seen that our Snapchat reporter was regularly recognised by people in the arenas, enabling us to move beyond our digital channels and engage directly with fans." The launch of “The Handball Zap” aims at benefitting from the momentum gained at the EHF EURO 2016 and providing a more regular coverage of the European Handball Federation’s competitions on Snapchat. The VELUX EHF Champions League is back in action with Round 10 in Groups A to D. Already after this weekend it will be known which teams face each other in the decisive knockout games in Groups C and D.
Match of the Week goes to Veszprém on Saturday with Hungarian champions Telekom Veszprém facing eight-time EHF Champions League winners FC Barcelona Lassa. Match of the Week will also be featured on the ehf_live Snapchat channel. To follow the coverage, scan the Snapcode below with your smartphone.